Better Meeting Results Every Time! By standardizing and streamlining note taking, decision making and task allocation, MeetingBooster consistently ensures effective meetings and increases ROI. When decisions need to be made, the meeting host or organizer must often take a vote or conduct a pro/con analysis. MeetingBooster's Voting, Rating and Pro/Con tools allow attendees to accurately visualize and assess all factors in the decision making process. MeetingBooster's wizard-based meeting tools allow meeting hosts, organizers or note takers to enter specific criteria to be discussed, customize rating metrics, and even take anonymous votes. The results of each tool are automatically added to the meeting notes, entered into the final meeting minutes and archived for future consultation. 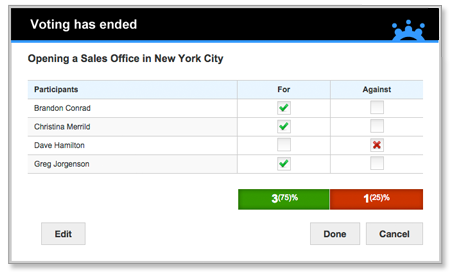 Drive accountability by assigning tasks to attendees on the fly. 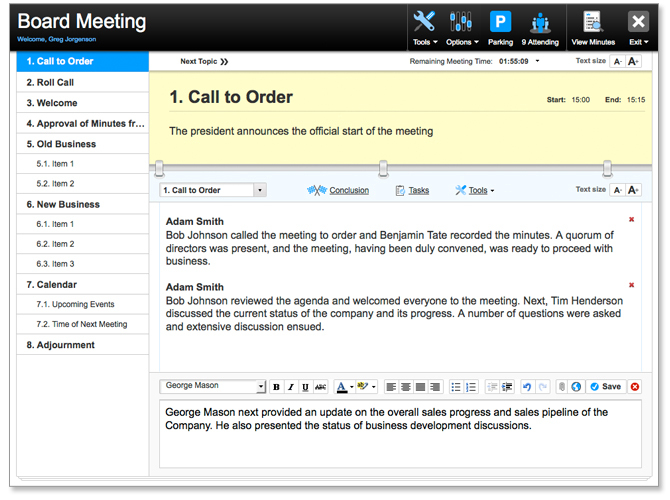 MeetingBooster’s proprietary Task module allows note takers to instantly define, assign and distribute tasks to attendees. Automated Task reminders relieve managers of the burden of continuously following up with task owners, thereby increasing accountability – every time. Attendees can view their personal task list online, and managers can get a complete overview using the Dashboard module. Meeting tools: voting, rating, pro/con evaluation, etc.